GRC on Facebook - You Really Like Us! The Facebook page for the Geothermal Resources Council reached a major milestone this weekend. The website has reached 700 likes, a measure of the popularity of the information service. The page was created on September 20, 2011 to provide a community for those interested in geothermal energy around the world. The pioneering facility, located in the Campo de Nijar, will be launched in October and will half the cost of energy used to heat greenhouses. 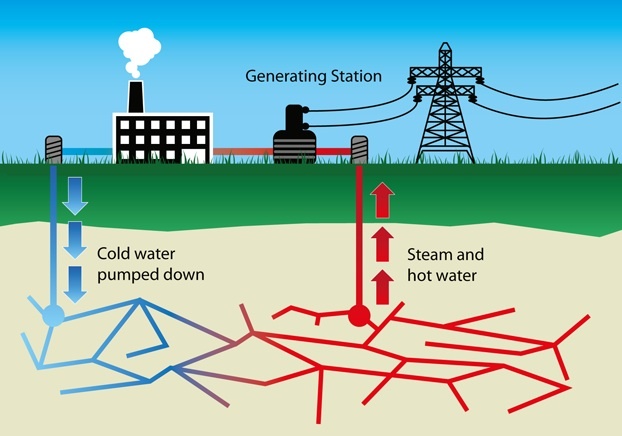 There are plans to generate electricity from the geothermal resource. The seventh annual Imperial Valley Renewable Energy Summit will expand its scope and delve into new renewable energy opportunities when it is held March 12-14. The theme for the event is “California’s Future: Powered by Imperial Valley.” As in previous years, the event will be held in the Imperial Valley, where the development of more than 2,000 MWe of geothermal, solar and wind energy developments has propelled the region into the spotlight as the renewable energy capital. Kenyan President Uhuru Kenyatta has appointed the founder of Mount Kenya University Simon Gicharu to head the Geothermal Development Company (GDC) a 100% state-owned company, formed by the Government of Kenya as a Special Purpose Vehicle to fast track the development of geothermal resources in the country. GDC is expected to drill 1400 steam wells to provide steam for the generation of some 5,000 MWe of geothermal power by 2030. Neighbors of Puna Geothermal Venture might not have to wait much longer to get money for their homes as Hawaii County catches up on the flurry of relocation requests it received over the past two years. The county has 27 pending requests with the relocation fund, established in 1996 with geothermal royalties to purchase homes of people adversely affected by the geothermal power plant, finished about four years earlier. Many came in during 2012 when more homeowners became aware of the option when geothermal again became a hot political topic. To handle the influx, the county Planning Department contracted with Prudential Orchid Isle Properties — recently purchased by Clark Realty — earlier this year to process the requests and help make property value determinations. Progress has been slow, but it could soon pick up. A ranking executive of Summa Kumagai Inc. (SKI), which owns a multimillion-dollar geothermal project in Sorsogon, the southernmost province in Luzon, is asking groups opposed to the project for a a dialogue with them in the presence of an international third party and provide SKI with enough time to discuss its side. SKI President and CEO Alberto D. Altura said in a statement on December 26, “We want to sit down with [those opposed to the project] to dialogue with us and have the World Wildlife Fund (WWF) to observe,” he said, noting that the anti-geothermal groups can bring the organizations that fund their protests. Expansion work on the Aluto-Langano Geothermal Power Plant launched on Wednesday, the Ethiopian News Agency reported. The US$30 million project will upgrade the plant's generating capacity to 70 MWe boosting the country's electricity supply from geothermal from the current seven MWe. The expansion project will be financed by assistance from the government of Japan, the World Bank and the government of Ethiopia. Located in the Rift Valley Lakes Region, the Aluto Langano Geothermal Power Plant is the first Geothermal power plant in Ethiopia. The plant was established in 1998 as a pilot plant to test the geothermal resources in the area. Covering an area of about 8km², various studies has indicated that up to 100 MWe can produced from the Aluto steam field. The GRC Board of Directors created the Geothermal Resources Council Foundation in 1986. Contributions to the Foundation help ensure future geothermal development through GRC education and information transfer efforts. Last year, the GRC was able to fund GRC's First Student Scholarships with money from the Education Fund and will do so again this year. Education Fund: Provides scholarships, speaker travel expenses and miscellaneous costs associated with educational activities. Pioneer Fund: Provides financing (if needed) for GRC operations and capital expenses. Publication Fund: Provides loans for production costs of selected GRC publications. You can donate when you join or renew your membership online or you can fill out the form below and email, fax, or mail it back to us. Ram Power, Corp. has announced that it has completed its previously announced offering of rights to holders of its common shares of record at the close of business on November 26, 2013. A total of approximately 67 million common shares were issued pursuant to the rights offering. The rights offering raised gross proceeds of approximately $5.4 million, the net proceeds of which will be used by Ram Power to fulfill upcoming interest payment obligations to the holders of Ram Power's outstanding debentures in the aggregate amount of approximately $2,180,000 due December 31, 2013 and for general corporate and working capital purposes. A chemical engineering professor at West Virginia University is being honored by President Obama for his work. GRC member Brian Anderson has been selected as a recipient of the Presidential Early Career Awards for Scientists and Engineers. It is the highest honor bestowed by the federal government on science and engineering professionals in the early stages of their research careers. The Ripley native was nominated for the award by the Department of Energy. Anderson has conducted extensive research in the areas of natural gas hydrates, thermodynamic modeling and sustainable energy and development in the area of geothermal systems. He earned a bachelor's degree in chemical engineering from WVU in 2000, and master's and doctoral degrees from Massachusetts Institute of Technology in 2004 and 2005, respectively. The city is known for its geothermal activity, and features geysers – notably the Pohutu Geyser at Whakarewarewa – and hot mud pools. This thermal activity is sourced to the Rotorua caldera, on which the city lies. The Geothermal Technologies Office is supporting researchers at Sandia (SNL) and Brookhaven (BNL) National Laboratories, to test elastomeric materials for use in high-temperature geothermal environments. To evaluate the quality and performance of elastomers for use in geothermal environments, these national laboratories are offering industry suppliers and manufacturers of elastomeric materials a third-party evaluation of their products. These rubber-like materials, extremely common in oil and gas operations, are critical to the functioning of many technologies but are highly prone to dysfunction at high temperatures. The materials will be tested in simulated geothermal environments, which will expose the elastomers to high temperatures and pressures, synthetic brines, and operational wear and tear. In the first phase of the project, commercially available products will be tested and evaluated for performance suited for geothermal settings. Follow on material development work may be possible during the second phase of the project. Test results will be published and made available to the public. Samples will be received through March 28th, 2014 and evaluations complete by September 30, 2014. If your company is interested in learning more about this free evaluation, please contact the Principal Investigators, Doug Blankenship, at Sandia National Laboratory, New Mexico, dablank@sandia.gov and Toshi Sugama, at Brookhaven National Laboratory, New York, Sugama@bnl.gov. We’ve all been there: searching for a lamp in a dark, unfamiliar room. How do you find it? Based on your experience, you may know where it is most likely to be, but you need to know where the furniture is, or you risk a severely damaged shin. Notice of Intent to Issue Funding Opportunity Announcement entitled "Geothermal Play Fairway Analysis." We use the same process when looking for energy resources buried so deep in the subsurface that there is no surface expression of their existence. Play Fairway Analysis is a practice first developed in the O&G industry that uses regional and detailed geologic and geophysical data to build a detailed picture of a buried basin to identify the most likely candidate locations for drilling. Based on this picture of the ‘room,’ explorers can more readily identify regions of the basin that are most likely to have one or more ‘lamps’ (or energy resource). While we cannot know for certain if a targeted site actually has the resource until we drill, the regions and their potential sites can be ranked on the probability of success so that we head for the most likely areas first. When used in O&G exploration, this process improves the likelihood of success of finding the desired energy resource – no more stumbling blindly in the dark – and reduces the costs associated with exploration and development. The town of Lakeview is putting the finishing touches on its new geothermal heating system. The system is being used to heat the town’s four schools as well as its hospital. At 185 degrees Fahrenheit, the water coming out the geothermal well is scalding hot. Both the school system and the hospital had to retrofit their old systems to draw the heat off that water before it’s circulated back into the well. Mililani Task, a leader of the Hawaiian Sovereignty Movement and a political speaker and attorney, weighs in on Geothermal in Hawaii with Think Tech's Jay Fidell. Mililani is a big supporter of geothermal energy in Hawaii. Shares in Australian company Wasabi Energy Ltd were suspended Monday after it said it had not raised enough funds to pay off its outstanding loan notes, or to fund its purchase of the Tuzla Geothermal Power Project in Turkey. On November 27 Wasabi said it wanted to raise up to USD14.8 million through a rights issue to complete the purchase of the Tuzla Project, as well as pay off its debt and provide working capital. On Monday, Wasabi said it was awaiting notification from its UK and Australian based registrars, but that current indications suggest it has not raised enough to allow it to repay its AUD8 million of secured loan notes, which are now due. According to the latest "Energy Infrastructure Update" report from the Federal Energy Regulatory Commission's Office of Energy Projects , solar, biomass, wind, geothermal, and hydropower units provided 394 MWe - or 100% - of all new electrical generation placed in-service in November 2013. There was no new capacity during the month from natural gas, coal, oil, or nuclear power. Renewable energy sources also provided 99% of all new electrical generating capacity in October. For the first eleven months of 2013, renewable energy sources have accounted for more than a third (34.9%) of all new electrical generating capacity: 2,631-MW solar, 1,108 MWe wind, 519 MWe biomass, 121 MWe hydropower, and 39 MWe geothermal. Geothermal steam now accounts for 0.33% of total installed U.S. operating generating capacity. For the first time in its history the Oregon Public Utility Commission has granted a request to waive a net metering limit. A 2 megawatt cap was approved this week for Oregon Institute of Technology’s developing solar and geothermal plant. “The waiver will allow Oregon Tech to proceed with its goal to become the first Net Zero campus in the nation, without incurring an estimated $2 million in additional expenses,” Maples said in a written statement. The net metering waiver will allow OIT to offset the school’s electricity costs with energy generated through the campus plant utilizing Pacific Power’s grid. Maples said without the waiver, the university would have had to rewire the campus and delay operations of the solar and geothermal plant for four years, costing at least $2 million. DD Energy Termelő és Szolgáltató Kft (DD Energy), a wholly owned unit of Hungary-based alternative-energy company PannErgy on Friday signed a contract with Audi Hungária Motor to deliver geothermal heat energy to the company’s plant in Győr for a period of 17 years, PannErgy representatives announced today. The Myth: Since renewable energy is intermittent, it is too unreliable to be the major source of electricity supply. Large penetrations of renewable energy into the grid must await either the development of baseload renewable power stations or a vast amount of storage. The refutation: Computer simulation modeling of electricity systems with 80-100 per cent renewable electricity (RE) refutes this traditional assumption. The simple conception of balancing baseload demand with baseload supply over a 24-hour period is outdated in the context of a RE future. It was appropriate when inflexible baseload power stations, coal or nuclear, were the only choice for 24-hour power. However, when large penetrations of RE are integrated into the grid, baseload power stations are not needed and their inflexibility becomes a liability. The computer simulations show that baseload demand can be supplied reliably by a mix of RE sources, none of which is, strictly speaking, a baseload power station, as shown in the figure above. As New Mexico’s Commissioner of Public Lands, my job is to generate revenue from our 13 million acres of State Trust Lands while protecting the health of these lands and resources for future generations. Despite last year’s record-breaking $653 million in State Land Office-generated revenue, which goes to support our state’s public schools, universities and hospitals, we at the Land Office are always searching for ways to earn more money for the people of New Mexico and to better protect our lands and the environment. One energy source that can do both things is geothermal, an abundant renewable resource in our state. This is an exciting time for geothermal power production in our state. For example, about 20 miles south of Lordsburg, on federal land, is a project to generate electricity from relatively shallow groundwater that is heated to more than 300 degrees Fahrenheit by the earth’s natural heat. Cyrq, the company that is developing the project, already has an agreement in place with Public Service Company of New Mexico to sell the plant’s 10 megawatts of electric power to the utility. Construction on the project is expected to begin in the last half of this year. Desert Report is a 24-page newsletter about the California and Nevada deserts. All policy, editing, reporting, and graphic design is the work of volunteers at the Sierra Club California/Nevada Desert Committee. Nevada is the bulls-eye of geothermal resources in the United States. The region of high geothermal potential is home to a multitude of hot springs and other thermal features, and these are just the surface manifestations of an abundant geothermal resource that can be tapped at relatively shallow depths in the crust. Scientifically supportable estimates indicate that this resource could, in principle, provide baseload power of 100’s of gigawatts. This would exceed the current combined needs of the western states, but for several reasons it may never be fully tapped. Global Geothermal News is Two Years Old! This website is celebrating it's second birthday today. 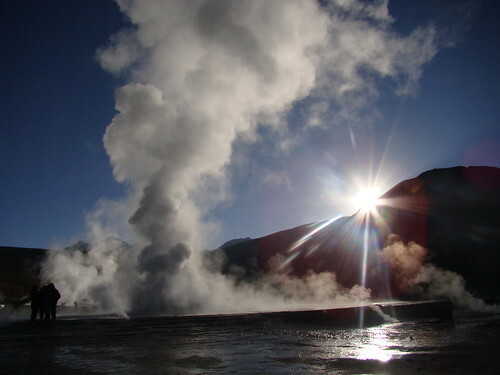 On December 21, 2011, we launched Global Geothermal News to bring the latest geothermal energy news from around the world. The website has grown into an essential source for up-to-date information for the geothermal community. In both 2012 and 2013, Global Geothermal News won an APEX Award for Publication Excellence, recognizing the respect for GRC in keeping it's members and followers informed. In two years we have posted nearly 3,000 stories, garnering over 150,000 page views. Global Geothermal News thanks its readers for following our progress and helping to make this website the geothermal news web site par excellence! From mere burgs to populous states to independent nations, islands have a particular motivation for going green: they can avoid the use of expensive and dirty diesel for power generation. Solar with some wind have typically been the technologies of choice, but Nevis, in what is becoming something of a Caribbean trend, is turning to geothermal. “The use of geothermal energy will not only make Nevis a greener place in the future, but also makes it less vulnerable to volatile oil prices, as the cost of geothermal energy is stabilized under a long-term contract,” said Alexis Jeffers, senior minister in the Ministry of Utilities. Michael Yackira, CEO and President of NV Energy, announced his retirement effective June 2014. 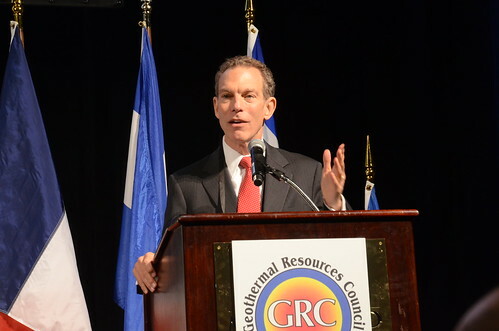 He spoke at the Opening Session of the GRC Annual Meeting in Las Vegas. MidAmerican Energy Holdings Company (MEHC) and NV Energy, Inc. announced that the companies closed their merger today after receiving the required final state and federal regulatory approvals or clearances from the Public Utilities Commission of Nevada (PUCN), the Federal Energy Regulatory Commission (FERC), and the U.S. Department of Justice. NV Energy will operate as a separate, locally managed company, and will continue to be headquartered in Las Vegas. It will continue to serve its 1.3 million electric and natural gas customers in Nevada. NV Energy will continue to be led by Michael Yackira, who announced his retirement effective June 2014. Paul Caudill, who most recently served as president of MidAmerican Solar, is joining NV Energy as president, effective immediately. Caudill will work with Yackira and the local leadership team at NV Energy as part of an executive transition over the next six months. A game of bureaucratic pingpong has Hawaii Island Mayor Billy Kenoi taking matters into his own hands and asking for an Environmental Assessment of an old Puna geothermal energy site leased by the Natural Energy Laboratory of Hawaii Authority (NELHA). Kenoi has been corresponding with NELHA, the state Department of Land and Natural Resources and the state Department of Health following a Sept. 9 report by the Geothermal Public Health Assessment Study Group. The report recommends the county “use the full strength of its influence with state and federal agencies and private landowners” to ensure the old HGP-A site, Hawaii Geothermal Project’s initial test plant, is free of contaminants. The El Tatio geothermal project has been cancelled due to Geotermica del Norte's failure to comply with project safety requirements. The developer has been fined US$384,000 by region II's environmental watchdog Corema. The company said it would withdraw drilling rigs from the area within three months and indefinitely suspend geothermal exploration at the site. The geothermal energy extraction project was being developed by the GDN JV of Codelco, state oil company Enap and Italian power company Enel. There has been simmering controversy over the project with the entire area being claimed by Atacama indigenous communities. Ram Power will complete the San Jacinto-Tizate project remediation drilling program in January. The company will sell The Geysers project early in the new year. Ram Power is currently conducting a remediation drilling program to increase the steam resource of the San Jacinto-Tizate project. The remediation drilling program calls for the refurbishment of four existing production wells as well as the replacement and perforation of specified well casings along with the deepening and forking of two wells. Ram Power and the lenders are in negotiations to amend the remediation completion date in the Common Terms Agreement, with such revised date to start in mid-January 2014. Following the completion of the resource remediation drilling program, Ram Power will conduct a plant capacity test expected to be concluded in mid-February 2014. The test includes a 30-day stabilization period of the resource field followed by a 7-day performance test to determine the net operating output of the plant. The overall remediation drilling program has a targeted increase in steam availability of approximately 9 to 14 MW, or 70-110 tonnes / hour of additional net capacity bringing total generation to approximately 59 to 63 MW (net). Ram Power, in its efforts to monetize the Geysers Project, has received several bids from interested parties looking to acquire the asset. The company will be evaluating those bids in the next few weeks with an expectation to enter into a purchase and sale agreement early in 2014. Any monies received will be used for further development of our pipeline projects and general corporate purposes. Funded by National Science Foundation and Department of Energy grants, a team of scientists from Lawrence Livermore National Laboratory (LLNL), the University of Minnesota (U of M) and Ohio State University (OSU) has developed a novel geothermal power plant design that leverages unwanted, captured carbon dioxide to boost both output and efficiency compared to conventional geothermal plants. The approach also extends the potential reach of geothermal power generation across the country. Planners for a new renewable energy–focused public power agency in Sonoma County on Thursday revealed that the optional all-renewables program will draw electricity entirely from the nearby network of geothermal power plants on the border of Sonoma and Lake counties, adding solar photovoltaic sources in the future. 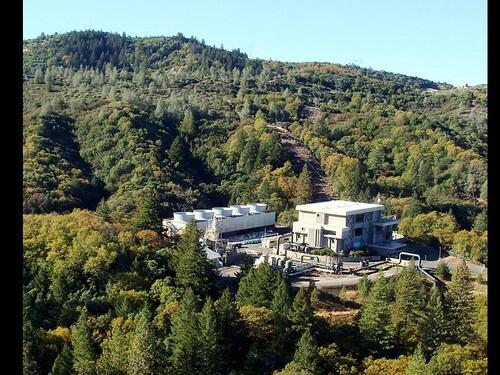 Customers opting for Sonoma Clean Power's "EverGreen" option could pay an additional premium of around 3.5 cents per kilowatt-hour under the proposed framework. The agency entered into a 10-year agreement with Calpine Energy Service for that geothermal power, the primary operator of power plants at The Geysers area. French conglomerate Alstom said Thursday it signed a 30-million-euro ($41-billion) contract with Mexican state-run electricity utility CFE to build a geothermal plant in the central state of Puebla. The "Los Humeros III - Phase A" plant, which is expected to begin operating in the second quarter of 2016, will have an installed capacity of 25 MWe and produce an average of more than 200 GWh per year of renewable energy, equivalent to the annual electricity consumption of 40,000 people, Alstom said in a press release. The Alstom-designed project includes the construction, set-up and operation of the plant, which will use heat obtained by drilling steam-extraction wells at a depth of up to 3,500 meters (11,475 feet). As with national trends, the energy sectors in each state continue to experience rapid changes, including increased oil and natural gas production, new renewable electricity generation, and changing motor gasoline prices. With these and other energy trends in mind, the U.S. Energy Information Administration updated its State Energy Profiles, which are available through EIA’s State Energy Portal. There are new analytical narratives on the energy sectors of each of the 50 states, the District of Columbia, and five U.S. territories. California is among the top 10 energy-producing states and the bottom 5 energy-consuming states per capita in the nation. It leads the country in electricity generation from geothermal energy, solar energy, and biomass. Policy makers, energy analysts, and the general public can access revised state-level analysis on the petroleum, natural gas, coal, and electricity sectors. In addition, the narratives feature a new section on renewable energy that details each state’s renewable resources, including biomass, geothermal, hydroelectricity, solar, and wind, and how those resources are being developed. The 20 MWe Maibarara geothermal power plant (MGPP) has secured regulatory approval for its dedicated point-to-point connection facility with the Manila Electric Company (Meralco) electrical grid. The project, according to the ERC filing, involves construction of 6.0 kilometer 115 kilovolt line from the MGPP’s switchyard to Meralco’s 115-kV line in Calamba City, Laguna. Last month, legislators on the volcanic island selected Nevis Renewable Energy International (NREI) to develop a geothermal energy project, which they said would eventually eliminate the need for existing diesel-fired electrical generation by replacing it with renewable energy. In January 2014, NREI will begin to construct a geothermal power plant and injection and production wells on Crown Land leased from the Nevis Island Administration. Energy Development Corp. (EDC) said today it expects to bring the 112.5 MWe Tongonan geothermal power plant in Tongonan, Leyte to full running capacity by the first quarter of next year after suffering damage from super typhoon Yolanda. The Tongonan geothermal plant, owned by EDC, forms part of the 650 MWe Leyte power stations that were severely damaged by Yolanda. EDC said its technical team identified the cooling tower restoration as a critical activity, requiring replacement of fan blade assemblies, shrouds, fills and the main structures of the cooling towers themselves. By using the Earth's magnetic field, combined with new innovative technology, drilling companies are increasing productivity while reducing development costs and environmental impacts. An article in the fall 2013 issue of Oilfield Review (PDF) highlights this technology and its applications across the world. It also discusses the public-private collaboration between the U.S. Geological Survey (USGS) and partners to successfully implement the technology. These days, multiple reservoirs of oil, gas and geothermal brine can be accessed from a single platform by drilling vertically and then horizontally. Drill operators need to know which way their drill bits are going to maximize production and avoid collisions with other wells. One way to accomplish this important task is to install a magnetometer—a sort of modern-day "compass"—in a drill-string instrument package that follows the drill bit. Scientists at the Energy Department’s Pacific Northwest National Laboratory (PNNL) have made a commercially viable discovery—how to capture substantially more heat from low-temperature resources. In a market where binary working fluids are costly and traditionally inefficient, this advance harnesses a much larger sector of near-term geothermal potential through inventive, low-cost solutions. Payback on this novel technology is now estimated in certain operational conditions at under 36 days, and DOE expects a commercialization plan by first quarter 2014. PNNL developed the innovative liquid—called biphasic fluid—with the capability for rapid expansion and contraction and added tiny nano structured metal-organic heat carriers (MOHC s) to boost power generation capacity near to that of a conventional steam cycle. The team found that the new working fluid has significantly exceeded performance requirements at lab scale, with a 15% increase in power generation and capital cost reductions at existing plants. Put all these pieces together, and this innovation creates a new energy producing cycle that allows developers to exploit low-temp geothermal sources for more economical power production. To engineer this innovation, PNNL’s expertise in nanotechnology and molecular engineering adapted advancements already underway at the lab. Nano fluids offer unique potential to improve efficiency of working fluids without major modifications to equipment or operating conditions – they increase thermal conductivity, improve heat transfer, and interact at the molecular level by increasing effective latent heat. Molecular stimulation of low-temperature resources from this project reduces capital costs, increases efficiency of the cycle, and expands the range of geothermal resources suitable for economic power production and waste heat recovery. Read more about low temperature resources. International support for geothermal energy in developing countries took a leap forward on October 28, 2013 when the Clean Technology Fund (CTF), a program of the Climate Investment Funds (CIF), approved $115 million for the Utility Scale Renewable Energy Program. This program will initially focus on facilitating private sector engagement in geothermal resource validation through test drilling – the first, and riskiest, step in geothermal energy development. 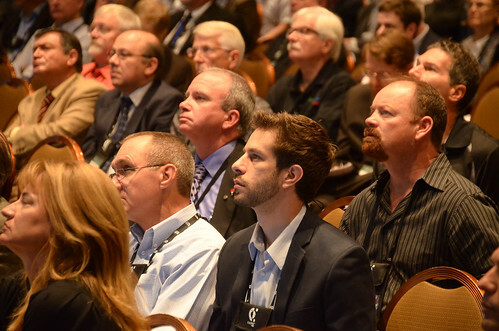 The Geothermal Resources Council (GRC) has announced the outstanding presentations from the global geothermal community for 2013. 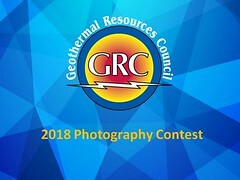 The judging was made in each of the technical sessions held in late September/early October at the 37th GRC Annual Meeting in Las Vegas, the world’s largest annual geothermal energy event. The judging criteria included the technical content, the quality of the visual aids and the presenter’s ability to communicate the subject matter. Over 150 presentations were made totaling over 50 hours. The GRC 2013 Annual Meeting attendees came from 37 different countries around the world highlighting the global interest in the geothermal industry and the worldwide reach of the GRC. The Bottle Rock Power Plant in Lake County, in The Geysers area, California, has received the go-ahead for an expansion project. Bottle Rock is currently producing 15 MWe. The expansion project will bring the capacity to 55 MWe requiring require the construction of two new well pads which can accommodate up to a total of 22 new geothermal steam production wells. Prohibition of geothermal power generation in protected areas would be lifted by the two presidential candidates who are leading the polls. Johnny Araya of the National Liberation Party (PLN by its initials in Spanish) and José María Villalta from the Broad Front (Frente Amplio) party, said they would allow the Instituto Costarricense de Electricidad (ICE) to explore geothermal energy in the Rincón de la Vieja National Park in Guanacaste. Since the 90's the ICE has operated geothermal outside Rincon de la Vieja National Park and Miravalles, but they have already taken maximum advantage of this. The institution believes there could be more potential in the Rincón de la Vieja, however, the National Parks Act prohibits any activity in protected areas. Salt River Project, a utility with 2 million customers in Central Arizona, is now receiving renewable energy from the recently completed Cove Fort Geothermal Project in Beaver County, Utah. The Cove Fort project utilizes binary cycle technology, allowing access to regions with lower temperature geothermal resources. Geothermal energy is considered renewable energy because no fuel is consumed and the energy is from a naturally occurring source. "Geothermal energy is an extremely valuable product and it greatly enhances our sustainable portfolio," said John Sullivan, SRP's chief resource planning executive. "It is one of the only renewable-energy technologies that can provide energy for our customers around the clock." Twenty-four U.S. senators are asking the leaders of the Senate Finance Committee to renew a slate of tax credits for renewable energy and efficiency, some of which are set to expire at the end of the year. Sen. Ed Markey (D-Mass.) took the lead on the letter, sent to Finance Committee Chairman Max Baucus and the committee's ranking member, Orrin Hatch. In it, Markey identified 10 different tax provisions designed to benefit clean energy that the senators want to see extended as soon as possible. Twenty-two Democrats and two Independents, Bernie Sanders of Vermont and Angus King of Maine, signed the letter, which argues that the tax incentives help create jobs while lowering greenhouse gas emissions. The credits include the expiring Renewable Electricity Production Tax Credit, which grants credits to operators based on the kilowatts of wind or geothermal energy their facilities generate. None of these credits were included in the budget deal that passed in the House last week, and which is expected to go up for a vote in the Senate this week. for the thermal use of pit water. Coal mining company RAG AG, formerly Ruhrkohle AG, annually pumps over 100 million cubic meters of water to the surface from a depth of up to 1,000 m to secure the stability of the ground and the safety of drinking water in former mining regions. For one year now, the municipal utility of Bochum has been heating several public buildings with that pit water. The pilot project demonstrates how to use old mines for an eco-friendly heat supply of surrounding buildings. Pit water, up to 50 °C hot, will be pumped up through former mines for safety reasons. In a pilot project, the municipal utility of Bochum demonstrates how pit water can be used for geothermal applications. A primary school, a comprehensive school with a canteen and a swimming pool and the main fire station of Bochum are being supplied with heat based on this energy source since the autumn of 2012. The fuel requirement of the existing buildings is to be reduced by approximately 1,200 MWh per year along with 245 tonnes of saved carbon dioxide emissions. 35 % of the total heat demand is covered by pit water. Chevron Geothermal Indonesia won a tender for geothermal exploration on Mount Ciremai in West Java, some while ago. Initially the company planned start of project work in 2013, but expects that work will start in 2014, according to the Head of Department of Water Resources and Mines for District Brass. The initial potential is estimated at 75 MWe with total potential of up to 150 MWe. It is expected that Chevron will conduct community meetings before any work starts. AP Renewables, Inc. (APRI) has bagged two new service contracts covering geothermal concession areas in Mindanao, an official from the Energy department said on Friday last week. Besides APRI, the department had also awarded a service contract to Basic Energy Corp. for a geothermal concession area in West Bulusan, Sorsogon, the company disclosed last week. The area hosts Mt. Bintacan, Mt. Tabon-Tabon, Mt. Sisigon, Mt. Malobago, Mt. Calomoutan and Mt. Sujac. Geoff Ward, CEO and Managing Director of Geodynamics talks about the announcement that the company has gone unconditional in the takeover of KUTh Energy Limited. The series of Twitter posts by the GRC announcing the days when geothermal energy is producing the most of any renewable energy in California, have been used in the campaign of CanGEA, the Canadian Geothermal Energy Association, to persuade legislators in British Columbia to consider the clean, reliable, baseload energy instead of hydroelectric power. @GRC2001 Thank you for letting everyone know. I used these recurring milestones as an example during the #SiteC Hearing this past Tuesday. The Lusi mud volcano can be seen from space! Scientists say the eruption of the Lusi mud volcano in Indonesia should be all but over by the end of the decade - much sooner than previous estimates. The assessment is based on satellite data that records the rate at which the ground is changing in response to the material spewing up on to the surface. Researchers say the system is losing pressure rapidly. The eruption, which began in the Porong subdistrict of Sidoarjo in East Java in 2006, is the largest of its kind. Lusi is thought to have been triggered by a drilling operation that went wrong. An expert panel convened at a meeting of the American Association of Petroleum Geologists in Cape Town in 2008 concluded that drilling fluid used to maintain pressure in the well was too dense for the strength of the surrounding rock. The resulting blow-out, or "kick", re-activated old faults, creating new pathways for water and sediment to rise up to the surface. The PGCertGeothermTech study program at the University of Auckland is a one semester course aimed at training engineering and science graduates for work in the geothermal industry, and includes two (week long) field trips to the Taupo volcanic zone. Applications close 4 July 2014 for a start date of 22 July 2014. It is important to apply early, as places are restricted to 25 each year. The course runs from July to November and is followed by the New Zealand Geothermal Workshop. A promotional video for the Ngatamariki Geothermal Power Station, the largest binary type geothermal power plant in the world, in New Zealand, bringing online 82 MWe for Mighty River Power. Allan Hoffman, Senior Analyst at U.S. Department of Energy (retired) writes about geothermal energy in his blog, Thoughts of a Lapsed Physicist. 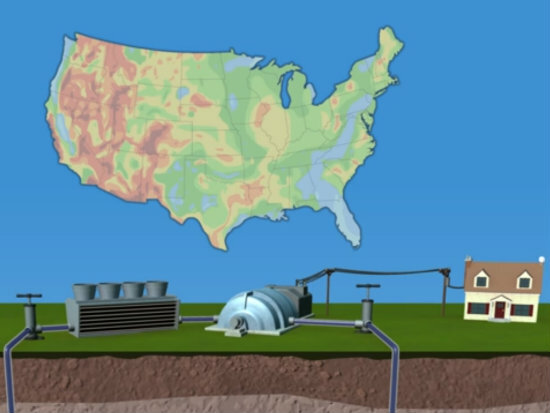 He has an interesting take on the history of Enhanced Geothermal System (EGS) in the USA. One piece of history about EGS: this technology was pioneered at Sandia National Laboratory with U.S. DOE support for many years post the Arab Oil embargo of 1973-4. In the mid 1990′s, when geothermal was one of the renewable energy programs I managed, I met in San Francisco with the heads of all U.S. geothermal power companies to discuss the technology’s future. It was a time of financial difficulty for the companies, limited Congressional budgets for renewables, and hard decisions had to be made on how to support a broad range of emerging technologies with federal funds. All at the meeting agreed that while hydrogeothermal was the basis of their existing businesses geothermal’s future was in hot dry rock. Not willing or able to have DOE support geothermal development close to 100 percent into the future, as had been true for many years, and being a strong believer in cost sharing to advance commercialization, I offered to meet the industry half-way on further EGS development – 50 percent DOE funding, matched by 50 percent industry funding – and to issue an RFP (Request For Proposals) committing DOE to that arrangement. Unfortunately, not one company submitted a proposal in response to the RFP (times were tough and anticipated energy costs from EGS were high) and I was forced to terminate the hot dry rock program. Today EGS is looking to be much more commercially attractive. In a corner of Portland's Henty Park surrounded by a cyclone fence sits the town's now defunct geothermal system. Constructed in 1983, it was unique in the world, and its 2006 closure was met with disappointment and anger that continues to simmer in the community. In 1978, Portland engineer Neil Buckingham began looking into the possibility of constructing a geothermal system in his hometown, that would take advantage of the hot water drawn from the ground for its water supply. Mr Buckingham says less than half the available energy was being taken from the hot water, and says there was potential to expand the geothermal system to grow fish, herbs and spices, and even to develop health spas. He was devastated when the bore was shutdown in 2006, and believes there was no justifiable reason for Wannon Water and the Glenelg Shire Council to do so. Indonesia is expected to pass a new law on the geothermal industry early next year, paving the way for the country to develop its geothermal potential, a forestry ministry official said. Asep Sugiharta, an official dealing with forest protection and biodiversity conservation at the Ministry of Forestry, said a proposed bill, which has been submitted to House of Representatives Commission VII, which oversees energy affairs, is set to become a landmark in the development of the energy business in Indonesia. He said the bill was expected to become law in April next year. Exxon Mobil Corp. says energy demand will only grow in the decades ahead, as the world’s population continues to increase and Third World societies modernize. In its annual energy outlook (PDF) released Thursday, the Texas-based oil giant predicts that by 2040, global energy demand will increase by 35 percent. “Fortunately, the world not only holds a vast and diverse array of energy resources, but we also possess increasingly advanced technologies that can safely and reliably supply this energy,” the report reads. Exxon has been dismissive of renewable energy. And while the company does not expect solar and wind power to play a large role in the future energy economy, it does predict 150 percent growth in the renewable sector. "Renewable energy supplies — including traditional biomass, hydro and geothermal as well as wind, solar and biofuels — will grow by close to 60 percent, led by increases in hydro, wind and solar. Wind, solar and biofuels are likely to make up about 4 percent of energy supplies in 2040, up from 1 percent in 2010. We foresee wind and solar providing about 10 percent of electricity generated in 2040, up from about 2 percent in 2010." "The shift away from coal and toward natural gas, nuclear and renewables in the power generation sector is an important contributor to the projected slowdown in global energy-related CO2 emissions,” the report reads. Researchers are developing a new kind of geothermal power plant that will lock away unwanted carbon dioxide (CO2) underground—and use it as a tool to boost electric power generation by at least 10 times compared to existing geothermal energy approaches. Tomorrow, at the American Geophysical Union Fall Meeting, the research team from Ohio State, the University of Minnesota and Lawrence Livermore National Laboratory, will debut a presentation "Multi-Fluid Geothermal Energy Systems: Using CO2 for Dispatchable Renewable Power Generation and Grid Stabilization," an expanded version of the design, along with a computer animated movie that merges advances in science with design and cognitive learning techniques to explain the role that energy technologies can have in addressing climate change. A comprehensive and clear-language introduction to the business of developing, executing and financing Geothermal power projects; led by a distinguished industry veteran. 12-14 May 2014 - London, U.K.